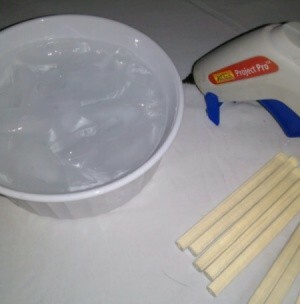 If you make a lot of crafts like I do, then you most likely own a hot-glue gun. If so, you are surely familiar with the nasty burns that inevitably come with using one! Hot glue is very painful and continues to burn your skin for several minutes after contact. To minimize the damage, I always keep a bowl of ice-water within easy reach on my work surface. The instant the glue hits my skin, I plunge my finger into the ice water. This stops the burn from causing more damage by curing the glue and instantly cooling the wound. The glue peels off easily and prevents the burn from becoming worse. I never use a hot glue gun without that bowl of ice-water; try it next time you craft- you'll be so glad you did! I use a glue gun a lot in various crafts. I simply don disposable gloves when I am using the gun. The gloves keep the hot glue off my skin - the gloves don't melt, if you are wondering! I keep a folded wet paper towel on a small plastic plate or lid and use it if the heat gets thru the gloves. A bowl of ice water will work, but I am a clutz and it would probably get knocked over! You can do so many things with a glue gun and it is very easy to paint and decorate with it.